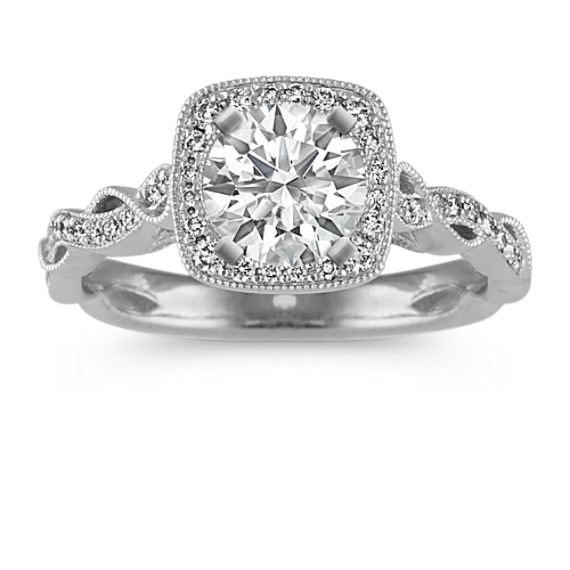 Round Diamond Vintage Halo Engagement Ring in 14k White Gold | Shane Co. This beautiful halo engagement ring is sure to catch her eye with its vintage milgrain swirl design. Fifty-eight round diamonds, at approximately .28 carat total weight, provide the perfect accent to the center stone of her choice at approximately .75 carat. Hand-matched for color and clarity, these diamonds are crafted from quality 14 karat white gold and the band measures 9mm at the halo and 2.5mm at the band.